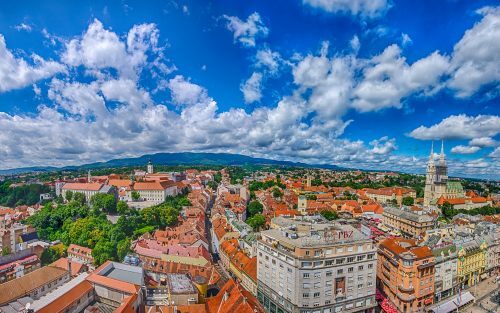 Condor Airlines has dropped the price of a few of their May flights from Vancouver to Zagreb, Croatia down to $741 CAD roundtrip including taxes. The flights have 1 stop each way, in Frankfurt. The price of the flights will show up as $699 CAD on Condor.com, but it will really end up costing $741 CAD, because Condor bills your credit card in Euros, which means your credit card company adds 2.5% to the transaction (and annoyingly, Condor doesn't mention this during the booking process). Condor also charges an additional fee just for booking with a credit card. And again, they don't mention this during the booking process. But all told, the extra 2.5% foreign currency conversion fee, and the additional 'just for booking with a credit card fee' will mean that your credit card is ultimately charged a total of $741 CAD instead of the $699 CAD that is displayed on the Condor website. Vancouver to Europe - from $518 roundtrip after taxes - Croatia for $654! vancouver, yvr, europe, central europe, southern europe, southeastern europe, zagreb, croatia, zag and balkans. 6 Responses to "Vancouver to Zagreb, Croatia - $741 CAD roundtrip including taxes"
The actual fare will be much higher. IRC, Condor posts the price in CDN for information purposes but your credit card is billed in Euros. There is also an extra fee for paying by credit card the last time we booked from Condor's website. Chris, I know you have been doing this for a long time. I am sure you are always open to suggestions, right? This fare has only 9 seats available at the time of posting. In future, can you include that or few seats available in your caption? There is way too much clickbait on the internet these days. Oh, and Jessica is spot-on. Your credit card is charged in Euros and Condor charges a ridiculous surcharge for using a North American credit card. Peter and Jessica, thanks for the feedback and suggestions, definitely appreciated. Unfortunately it's not always possible to know how many seats are truly available, depending on the airline website or the booking site. '1 seat left' - there really is just one seat left at that price. '2 or 4 seats available' - often not accurate. There are a *lot* of sites that show 2 or 4 as a default, but there are often really more seats available at this price on those particular dates than just 2 or 4. '6 seats (or more) available' - usually an indication that there are really quite a few seats available. You'll never see a website claim '30 seats available' for example, when there really might be. Airlines load their fares in 'fare buckets'. What this means is that if a site says '2 seats available' at a cheap price and you try to buy 3 seats, you probably won't get the cheap price. BUT - if someone buys the 2 seats available at the cheap price, it's possible the airline will immediately make '2 seats available' again at the same price. So in reality, there are more seats available at the cheap price than what is shown on the site. Thanks for letting me know that Condor.com always bills in Euros. That's really annoying. So with the additional 2.5% currency conversion fee for booking in Euros, that's likely to add about $16 CAD to the total. Looks like the credit card surcharge is 18 euros, also subject to the 2.5% currency conversion, so likely another $26 CAD. I will update the price and the blog post, thank you. Thanks for clarifying. That makes total sense. However, your snapshot showed only 9 seats available so you already knew seats are limited. The limited seats caption could've easily been added. As far as currency rates go, one should post the financial institution's rate eg. RBC, BMO, etc and then add the currency. Most people simply used whatever is convenient to determine Canadian dollars, for example Bank of Canada's rate or using Google. This will typically result in a significant difference. Since people must pay by credit card, I suggest they Google "Mastercard International Currency Converter" even if they use another credit card. It'll give a much more accurate representation of how much it really costs. Unfortunately. Amex and Visa don't disclose their exchange rates publicly. Peter I think you need to reread what Chris wrote. "'6 seats (or more) available' - usually an indication that there are really quite a few seats available. You'll never see a website claim '30 seats available' for example, when there really might be." I just searched on Condor's website for the deal and it is still showing 9 seats available. I find it hard to believe that since Chris posted the deal yesterday that no one has booked a flight at that price. So it's actually not as limited as you suggest. why not use a credit card that doesn't charge conversion fees? Like Amazon.ca visa. Rates are posted on Visa website - https://www.visa.ca/en_CAsupport/consumer/travel-support/exchange-rate-calculator.html - so you exactly know how much you're paying.